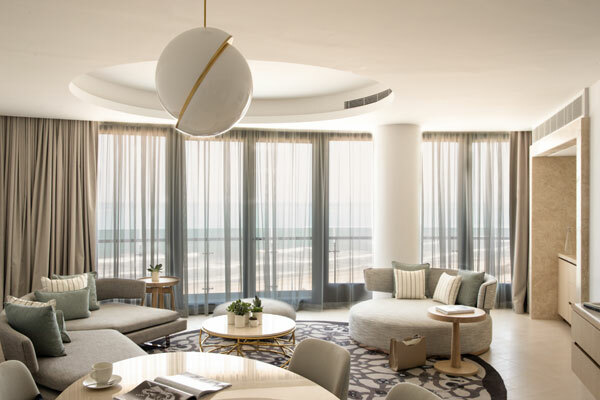 Jumeirah Group, a global luxury hospitality company and a member of Dubai Holding, has announced the opening of Jumeirah at Saadiyat Island Resort in Abu Dhabi, the group’s first luxury “eco-conscious” Resort. The resort overlooks 400-m of mesmerising sand dunes and provides a luxurious, family-friendly and environmentally-sensitive holiday destination, just 10 minutes drive from Abu Dhabi city centre. Saadiyat Island is undergoing a remarkable transformation into a world-class leisure, culturally connected and residential destination. The Louvre Abu Dhabi, also located on the island, opened last year to international acclaim and has since received over a million visitors. It will be joined by the Zayed National Museum and the Guggenheim Abu Dhabi, making the island a hub for global culture, arts and entertainment. The resort is only 10 minutes away from Yas Island, famous for hosting the annual Formula 1 Etihad Airways Abu Dhabi Grand Prix, Yas Mall (the second largest mall in the UAE) and a variety of world-class theme parks including Yas Waterworld, Ferrari World and the recently opened Warner Bros. World. Located on 9 km of white sand beach on the shores of the Arabian Gulf, the resort offers each guest a front-row seat to breathtakingly beautiful scenery and undisturbed wildlife including hawksbill turtles, dugongs, humpback and bottlenose dolphins, flamingos and gazelles. CEO José Silva said: “We are proud to bring Jumeirah to Saadiyat Island and to open our second luxury hotel in Abu Dhabi. The opening is a significant landmark in achieving our strategic expansion goals worldwide and is our sixth Jumeirah hotel to open this year." "We are confident that Jumeirah at Saadiyat Island Resort will further enhance Abu Dhabi as a distinct and diverse tourist destination, and we look forward to welcoming guests from the local community as well as international travellers. We anticipate it will be a very popular and welcome addition to Saadiyat,” he added. The hotel comprises 293 beautifully designed modern, sunlit rooms that overlook the open ocean, six panoramic suites with floor-to-ceiling windows and private balconies, plus eight private two-, three- and four-bedroom villas with their own private pools. It also includes three outdoor infinity pools, a kids' pool and the very first Bodyism Wellness Centre in the UAE. The spa is the resort’s lavish 2,700-sq-m haven of tranquillity and quiet sophistication. It features a grand Moroccan hammam, 15 treatment rooms with male and female facilities that include saunas, hydrotherapy pools, steam rooms, salt rooms, experience showers and a traditional Arabic rasul room. Guests staying in one of the four Spa Villas can enjoy pampering experiences in the privacy on their own room. The resort offers a variety of restaurants and lounges with a diverse, yet refined array of culinary options, serving up everything from sophisticated Middle Eastern cuisine to relaxed poolside dining. Guests can savour traditional Arabic flavours at Levantine-inspired Tean, take long poolside lunches with refreshing drinks at the pool bar and dine al fresco at Mare Mare which serves the finest of Italian cuisine. White, the resort's chic all-day dining restaurant, offers local and international dishes alongside live cooking stations for a remarkable dining experience. For guests looking for a more authentic experience, Majlis Saadiyat offers the warmth of Arab hospitality and a premium selection of refreshments, tea, coffee and delicious pastries. Golf aficionados will enjoy the close proximity to Saadiyat Beach Golf Club, the Arabian Gulf’s first beachfront course. The 18 hole course, designed by revered golfer Gary Player, harnesses the stunning natural beauty of Saadiyat Island to create an unrivalled sporting experience made all the more rewarding by spectacular views of crystal blue waters fringed by pristine white sand. “This resort is a place like no other. Located next to one of the most spectacular beaches in the Arabian Gulf, every aspect of the resort's design has been influenced by the beauty of this location,” said Linda Griffin, Jumeirah at Saadiyat Island Resort general manager. Jumeirah has partnered with Dubai-based water treatment company Trust Your Water to offer guests locally-sourced filtered still and sparkling water in reusable bottles that can be refilled at the resort’s water stations. The resort has also eliminated the use of plastic straws, favouring straws made from recycled material instead.